Cobblers boss Rob Page is delighted to have sealed the signing of defender Aaron Phillips following the player’s release from Coventry City. The 22-year-old has put pen to paper on a two-year deal at Sixfields, and becomes Page’s first signing as Northampton Town manager. The attacking right-back has played at league one level for the past three seasons, making more than 60 appearances for the Sky Blues, and Page believes he will provide excellent competition for Brendan Moloney at Sixfields. “Aaron is a very welcome addition to the squad,” said Page. “He is a young player with potential, but he also has a fair amount of experience in league one and that is important. “Aaron is a mobile full-back with power and pace and plays with his heart on his sleeve. Phillips’ signing comes on a day when Cobblers chairman Kelvin Thomas confirmed the club will not be signing midfielder Danny Rose, who looks likely to join Portsmouth. Rose had been offered a new deal to stay at Sixfields, but he will now not be returning. 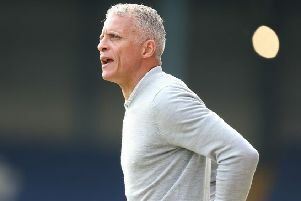 Page has already stated how happy he is with the squad he has inherited at Sixfields, and says the signing of players such as Phillips is going to be the way forward. “The players who are already here did really well last season,” said Page.